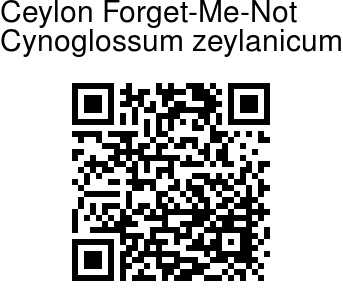 Ceylon Forget-Me-Not is an erect, branched herb; branches more or less bristly with bulbous-based hairs. Leaves 3-8 x 1-1.8 cm, ovate-elliptic, margin fringed with hairs, entire or obscurely toothed, tip pointed, base wedge-shaped or subpointed, bristly on both surfaces. Flowers bluish-white, in at branch-ends, simple or furcately branched one-sided racemes ; flower-cluster-stalk hairy ; flower-stalks 3 mm long, curved. Calyx 5-lobed ; tube 1 mm long ; sepals 2 x 1 mm, enlarged in fruit, hairy without. Flowers are 3-4 mm long, rotate ; Petals rounded at tip ; scales 5 at throat. Stamens 5, inserted on flower tube ; filaments short ; anthers 2-celled. 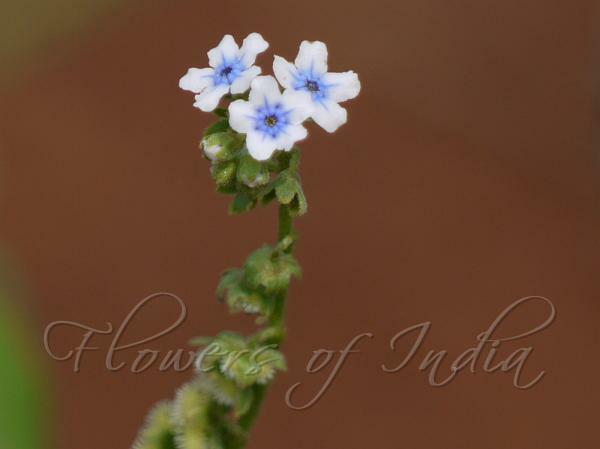 Ceylon Forget-Me-Not is commonly found in Western Ghats and Ceylon. Flowering: June-November.